“Words create words,” the great Rabbi Abraham Joshua Heschel would tell his children. Which is helpful (and convicting) when we’re thinking about the words we choose. It’s challenging, even heartbreaking when we think of some of the words spoken that have been over our lives. How do we reject words that have harmed us? That may have been said with good intentions, but have left scars none the less? Time to reject some words, friends. wanted to be picked first for the team. “Pick me, Jesus, please pick me.” In adult life, it played out through endless people pleasing to the detriment of my health and sense of self. Slowly, year by year, failure by failure, I've realized that Paul believed it when he said: “Very rarely will anyone die for a righteous person, though for a good person someone might possibly dare to die. But God demonstrates his own love for us in this: While we were still sinners, Christ died for us.” (Roman 5:8). The way we’ve used the word “in-spite” has made me feel undeserving of the grace of God. And even though I may be underserving, we’ve made that the point. We’ve bolded that part, rather than the love and grace part. It creates a false sense of humility. The kind that doesn’t build us up to love and good works, but to performance and striving and working for worthiness. An earning grace kind of faith. How we see God directly influences how we see others. If there’s a chance I’m not worthy, there’s a chance you’re not, too. It becomes a race for worthiness, who's in and who's out, who’s better and who’s not good enough, who wins and who loses. It fosters, if not creates, self-righteousness, a sense that others can be left behind because, after all, we don’t deserve it, and only a few will ever make it, and goodness, I hope I do. Our worthiness has never been the point. Ever. 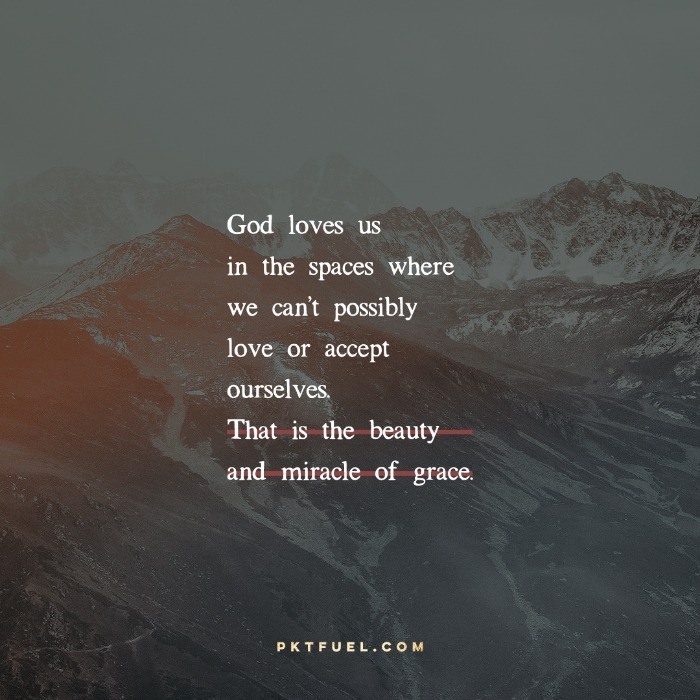 God loves us in the spaces where we can’t possibly love or accept ourselves. THAT is the beauty and miracle of grace. God shocks and stuns us into love by scooping the entirety of our lives into himself. It’s that old cliché: God doesn’t love us IF we change, he loves us so we can change. All true and good transformation begins with love and grace. “Now God has us where he wants us, with all the time in this word and the next to shower grace and kindness upon us in Christ Jesus. Saving is all his idea and all his work. All we do is trust him enough to let him do it. It’s God’s gift from start to finish!” Eph 2:8 (MSG). His love and grace is a gift. Not in spite of who you are and what you’ve done, but because of what you’ve done (for healing and restoration) and because of who you are: a child of God. You are not an offense to God. You are his joy. Drop the words “in-spite” and “underserved” and humbly yet boldly accept the gift that’s always been yours. This is wonderful Lizzy. I taking myself on an “in spite of” detox. Just had an operation in st Vincents all good but tomorrow Dr will talk about “my fatty liver ” I told him not to mention it because therapy is working fine. I have to stop saying “God loves me (in spite of ) me being fat.” Love. Liz, I do not under stand this line. It means that Jesus love for you isn't IN SPITE of you. God wraps the entirety of you up into love. All the things you are, and all the things you've done. Hope that helps! Hi Liz…SOOOOO good!! Every part of this rings true for me and I'm sure SO many. Since this is a series of “words” I'd like to take this moment to say how much YOUR words speak life and truth in such a lovely and grace filled way. You are so gifted in taking scripture and illuminating it to us in a real life, workable way. Thank you so much for overcoming your “lies of the evil one” of doubt and not being enough(ish) stuff and being wonderfully obedient in having this devotional. Keep on the path. you are a good and faithful servant to me and soooo many!